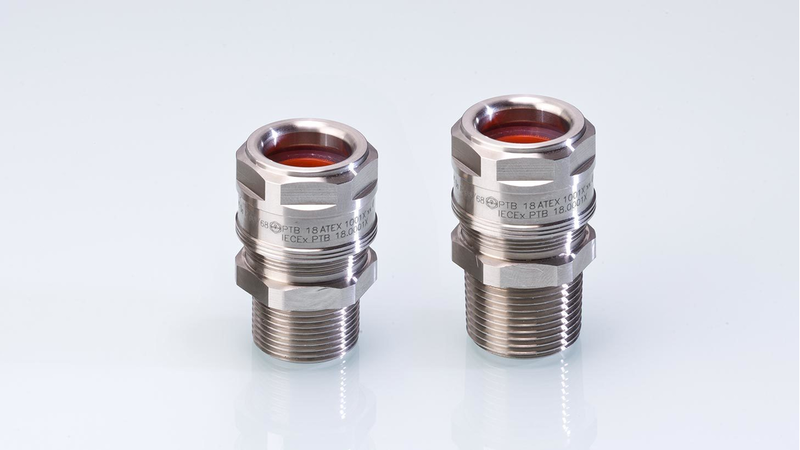 The LevelEx is a special "Ex-d" and "Ex-e" cable gland that extends the PFLITSCH range of explosion-proof cable glands. In addition to its compact design, it offers even more advantages: The LevelEx consists of only four parts. The sealing elements are of captive design and cannot be lost during assembly. The LevelEx achieves the type of protection IP 66 or rather IP 68 and thus corresponds to the types of protection flameproof enclosure "Ex-d" and increased safety "Ex-e". For the LevelEx, sizes from M16 to M63 or 3/8 "to 2 1/2" NPT threads with galvanized brass and stainless steel fittings are available. Thanks to the wide temperature range with values from -60 °C to +130 °C and approvals to ATEX, IECEx and DNVGL, it can also be used in extreme environmental conditions. LevelEx has met the minimum requirement of 30 bar/10 sec for the flameproof test. Even with a reference pressure of 20 bar and a temperature down to -60 °C, the new PFLITSCH Ex cable gland can be used without restriction. The fact that the components used meet the requirements of IEC and EN standards 60079-0 and 60079-1 was confirmed by PFLITSCH with the IECEx certificate. In addition, LevelEx has the following certificates: DNV GL and CNEx.